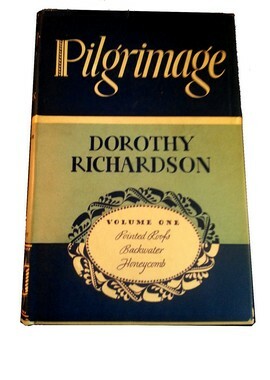 These are the second and third novels in Dorothy M Richardson’s Pilgrimage sequence, and, like the first – Pointed Roofs (1915) – they are as realist as one could hope for in a modernist novel. 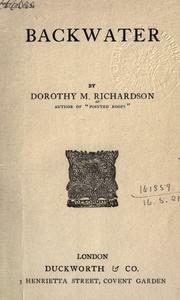 The narrative is straightforward, albeit entirely through the perspective of the narrative voice, Miriam Henderson, a girl from Barnes now marooned in a North London private school, and then in Newlands in (one supposes) Surrey, at the home of Mr Corrie the judge, and his under-occupied erratic wife, and their clever, rich, smart set. Miriam is still a teacher, as she was in Pointed Roofs. In Backwater she teaches in a basement and loathes the sisters who run the school, and North London itself. In Honeycomb she is a cossetted, pampered governess with very little to do. I found it hard to disentangle these novels except by their events. Compared with the later volumes (I’m currently struggling through Revolving Lights, vol 7), the first three volumes are almost Victorian for clarity, linearity and plot, so it’s probably safer to talk about them together, before the narrative hinges start shaking loose. 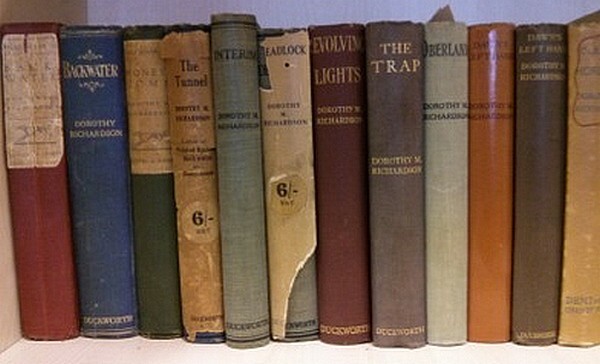 The only reliable way of recalling what happens in each volume is to keep a running list, and treat them like episodes of Friends: ‘The One Where Harriet and Gerald get married at the same time as Sarah and Bennett’, ‘The One Where Miriam Walks along the Cliffs with Mr Perrow’, ‘The One Where Miriam Loves the Toboggan Ride at the Crystal Palace Fireworks’ and so on. But this is to beg the question: are we supposed to read these novels as collections of interconnected and designed incidents, in which one will have a bearing on others, as part of a complete and rounded-off design? Or are they simply slices of Miriam’s life, in which one event or person has no more significance or inner resonance than another? Friends is an everlasting soap opera in which not much happens, but the way that the characters interact and grow is more important than its plots. Is Pilgrimage a soap opera? Miriam is central to the whole sequence, though her sisters and some friends and employers become less peripheral and more recurrent in each volume. There are no best friends or permanent secondary characters: even her sisters fall out of favour over time. Miriam’s passion for living alone in London as an independent person (in the 1890s, she’s absolutely a New Woman) propels my interest, because I too spent my twenties living and working alone in London in a succession of jobs and rented rooms, and I loved it passionately as well. But I hope very much that I was never as sour and intolerant and angry as Miriam (especially by vol 7) becomes. In Backwater Miriam struggles against a miasma of clinging dependency emanating from her spinster employers. They repel her while they try to draw her in, and this cloying persuasion drives her to resign. She thinks the school unhealthy, the system unkind, the pupils largely taken advantage of and a waste of her time to teach, and she resents any encroachment on her personal time or space from her employers. Its North London setting is part of her horror, and I cannot say that this is persuasive. I’m prepared to accept that she hates her surroundings and loathes her job – think Villette – but the reason why is too deeply embedded in Miriam’s angry personality to rouse my empathy. The narrative is scrupulously honest, utterly realistic. There is no foregrounding, no hinting or colouring-in more intensely one incident over another, so each thing happens, and life goes on, and there is no way the reader will be able to anticipate drama in the offing. Each event has the same emotional power and immediacy, and exudes integrity. It is a remarkable work. Where Backwater has integrity, Honeycomb reeks of guilt. In Backwater Miriam was working too hard and physically suffering. In Honeycomb she is lapped in unearned comfort, as the anxious but happy governess of two intelligent, lazy children who concede that they had better learn something to get the morning over with. There is an overwhelming sense of something dreadful about to happen, an awful fate in store for Miriam who is doing so little for so much. But this is brought about completely by a habituated expectation of a righteous plot of Victorian guilt and deserved punishment for not working hard and keeping one’s place. I have no idea if this theory would be accepted by Richardsonians, but it seems to be a game that the author plays on the reader, making them feel trouble coming due to one set of learned associations, but shows them something entirely different. Miriam’s life at Newlands is not corrupt, and she breaks no law and does not behave dishonourably (it matters very much to Miriam that she adheres to her private, rigid code of honour), but it is a life of unearned comfort and riches, and this has got to be paid for. She is bored, and picky, critical now as a matter of course, rather than the tolerant, friendly personality she seemed to have been in Pointed Roofs. Her creeping contempt for Mrs Corrie’s slack principles and lack of any occupation, diminishes Miriam’s spirit just as it reduces her enjoyment. Honeycomb ends abruptly, miserably, with very little explanation, when Miriam has taken her mother to the seaside, and the dreadful things that we have felt to be waiting arise and engulf them both. Stepping back from the plot, I do wonder if these should also be characterised as historical novels. These first three were published, respectively, in 1915, 1916 and 1917, yet nothing of the First World War is felt in their content or mood. The passionate love Miriam feels for clean, orderly, musicianly German life in Pointed Roofs is remarkable considering it was published when anti-German feeling was being whipped up by the British tabloids. The feeling persists in Backwater and Honeycomb: the German school in Hannover is the standard which Miriam’s next teaching jobs failed to achieve. Germans are lovely people, Germany is beautiful, and so on. To achieve this much separation from the mood of the day by writing against popular sentiment and to hold true to an artistic truth is, again, remarkable. The novels are set in the 1890s, so they don’t quite reach the rule of thirty years between the novel’s setting and year of publication that normally distinguishes a historical novel from a contemporary one (an arbitrary rule invented by modern critics, I think), but they function as if they did. Does that make Pilgrimage a historical saga? I will have to keep reading to find out. For the other reviews of the volumes in Pilgrimage, see Pointed Roofs, The Tunnel and Interim, Deadlock and Revolving Lights, The Trap and Oberland, Dawn’s Left Hand and Clear Horizon, and Dimple Hill and March Moonlight, and see also my conversation with Brad Bigelow of The Neglected Books page.